Valve designed by H.J.Round (Captain) . A high frequency amplifying Triode of 1916 still being used in 1937. Marconi D43 single Diode Valve of 1938. 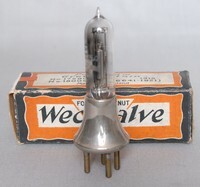 Called the Weco (Western Electric Company) or Peanut Valve. Mullard also produced this valve. Ideal for battery equipment with a nominal 1Volt quarter amp heater, and only 17-45 volts anode. The Mullard version complete with 4 pin adapter was advertised in The Meccano Magazine in 1924 for 30 shillings. Made in Britain from the American version with a British 4 pin base. Also made by B.T.H.Co. and called the Weco Valve. Mullard also produced this valve. Ideal for battery equipment with a nominal 1Volt quarter amp heater, and only 17-45 volts anode. Unique valve made by Mullard in 1939, which was never fully produced , no known equipment ever used it. This sample was found in a cellar at a Radio/TV manufacturer (Bush), probably engineering sample. The base is a locking type with bent pins to 90 degrees. Standard Telephones and Cables stopped trading their Micromesh range of valves around 1935, This is an indirectly heated Pentode Type PEN B1 output valve, designed for use in battery sets. It has a 2 volt 0.2 amp heater, with a very low HT drain. Osram HL410 was a Battery dull emitter with a 4 volt heater of 1928. The Philips 'Q' was a space-charge-grid Tetrode, the base had a terminal on the side for the inner grid. With a bright-emitter filament 3.5volts. The 'R' Valve was developed from the French hard vacuum valve of WW1 and was made in the UK from 1916 by the Marconi Osram Valve Company. Its use in new equipment declined in 1925 with the introduction of the lower power dull emitter valves. The first ever broadcast from Savoy Hill in 1923 used these valves in the audio amplifier. This was the first UK Hard Vacuum valve to go into production, historically so important that a company in Europe started making copies for enthusiasts who wished to make early wireless sets work. Elmer B Myers one of the directors and chief engineers, designed and marketed the RAC3 Audion aiming for the business of the amateur operator rather than the broadcast trade. This tube was first advertised in December 1920. It is a Triode with a 4 volt filament. Made by the Canadian company, E.B.Myers, of Montreal. 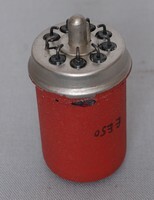 Helix wound anode valve. The Thorpe K4 was a tetrode of the space charge grid type. It was intended primarily for use in the Unidyne or Solodyne circuits which were popular at that time. The advantage of this valve was that no separate anode voltage supply was required, as both anode and inner grid were fed from the 6 volt filament battery. In the period 1925-1927 the K4 valve was offered for sale by at least three vendors in London, but although distributed by Bower Electric Ltd was not advertised by them. 3 x triodes, Cathode 4V- anode 90V. One of the most fascinating valves you will ever see, the Loewe 3NF incorporates three triodes, two capacitors and four resistors in a single glass envelope. The inclusion of the passive components reduced the number of pins required to six, but to avoid them contaminating the vacuum, they are each sealed inside a glass tube. One of the reasons for the development of this amazing device was that in Germany, there was a tax on receivers based on the number of valves in the set, so in 1926, Loewe Radio A.G introduced the 3NF, and also another multi-valve, the 2HF, which contained two screen-grid tetrodes, two resistors and a capacitor, intended for use as a two-stage RF amplifier. The original Loewe multi-valves are masterpieces of glass work, which must have been very expensive to manufacture, so later versions used a mica supports, and the glass was given an aluminium outer coating to hide the less elegant internal structure. An obvious drawback of putting three valves in a single envelope is that if one filament fails, the whole device becomes useless, but to counter this disadvantage, Loewe offered a repair service to replace failed filaments. Triode, indirectly heated, with 5 pin Base. 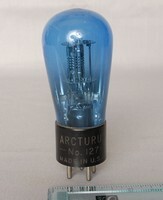 The blue colour was used as a trade mark of the Arcturus Radio Tube Company. Tetrode of 1922 made in Germany by Siemens and Halske. The Mullard ORA Valve of 1923. The title means Oscillates Rectifies Amplifies. The three possible main functions of the valve. The Broadcast station 2LO was listened to by receivers using this valve, known as a loudspeaker valve replacing the need for headphones and speaker horns on crystal receivers. (Loud Speaker valve No3). The Cunningham Audiotron, used as a detector amplifier. Launched in 1915 in competition with DeForests Audion Valve. The Marconi Osram Valve Companies DEV Triode Valve of 1925, with dull emitter filament. See Item A0630. Cossor P2 Directly heated battery valve, with Helmet anode. High Frequency amplifier of 1929. First Dull Emitter valve with a 2 volt heater of 1922. (DER Dull Emitter Receiver) This was a Derivative of the 'R' type with a thoriated tungsten filament of 0.63 Watts ( 1.8 volts 0.35 amps ) which reduced filament power by a factor of 4. Developed 1st by the Marconi Osram Valve Company. Developed by H.J.Round (Captain) for the Marconi Osram Valve Company. The S625 was one of the worlds first fully screened RF amplifier valve. 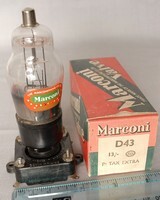 The Marconi Osram Valve Company developed the S215 in 1928. It was a 2 volt filament screened RF Tetrode, and was the upright version of the S625 See Item A0632. The Marconi Osram Valve Company Nicknamed this shape as a 'Catkin' A miniature cooled anode tetrode, the idea was to dissipate as much heat as possible from the anode to the air. Inside the can was a metal envelope that was in fact the anode itself, the can was added to prevent the user getting a shock from the anode. This valve is a screened RF Tetrode Frequency Changer. See Item A0637 for an earlier version.